As the First World War was entering its final stages, a pandemic of unprecedented virulence, which we now know to be the H1N1 influenza virus, infected one billion people around the globe and may have killed approximately 100 million. It spread with remarkable speed, striking in three almost simultaneous waves in various parts of the world. It initially appeared in the late spring and summer of 1918. It then returned in full strength in the autumn and early winter of that year, and reappeared for a final deadly bout in the early months of 1919. The helplessness of the medical profession (which only discovered that influenza was a virus two decades later) irreparably punctured positivist confidence in modern science. It was misnamed ‘Spanish influenza’ because newspapers in neutral Spain freely reported on the epidemic (including the illness of King Alfonso XIII), as opposed to the belligerent states, which suppressed news reportage in order not to demoralise the war effort. 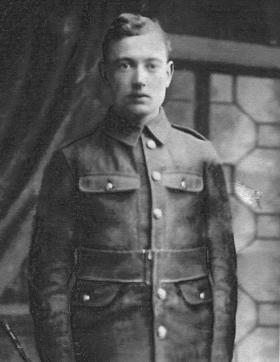 Although its provenance remains uncertain, a disease with similar symptoms was documented among British troops during the winter of 1916 in Étaples and Aldershot. Current research, however, highlights the outbreak in US military cantonments in March 1918 and suggests that it may have spread from there through networks of worldwide mobilisation. It is often said that the pandemic killed more people than the Great War, which had an estimated death toll of ten million. 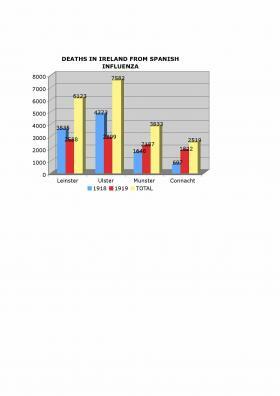 Although this is true globally, it was not the case in a regional perspective, as European war casualties outnumbered the over two million estimated influenza fatalities across the continent. In Ireland 20,057 people were reported as having died of influenza in 1918 and 1919 (the average annual rate for the preceding years of the war had stood at 1,179). In addition, an increase in deaths caused by related illnesses, most notably pneumonia (from which over 3,300 died above what would usually have been expected), can be attributed to the epidemic. Sir William Thompson, the registrar-general, admitted that the official influenza mortality rate was a conservative estimate, and there are reasonable grounds to assume that additional influenza deaths in Ireland were uncertified, attributed to other illnesses, and often simply not recorded at all. The overall number is probably lower than fatalities of Irish servicemen in the First World War but exceeds deaths in the War of Independence and the Civil War. Applying to official mortality figures an estimate that only 2.5% of those who caught influenza actually died suggests that there were over 800,000 influenza cases in Ireland, 20% of the population. Between June 1918 and April 1919 the epidemic, which further taxed a health service already struggling with war-related shortages of medical personnel and hospital beds, temporarily incapacitated urban and rural communities across the island. The first wave, which hit Ireland in the early summer of 1918, was the least destructive, although severe enough for schools and businesses to close. The earliest verifiable record of its arrival in Ireland can be found in US naval archives, which document an outbreak on the USS Dixie, docking outside Queenstown (Cobh), in May 1918. On 12 June the Belfast News-Letter reported that Belfast had been struck by a mystery illness resembling influenza. By the end of June there were reports that it had reached Ballinasloe, Tipperary, Dublin, Derry and Cork. Nevertheless, by mid-July the first wave had abated. The second wave, from mid-October to December, was the most virulent of the three; and, as in the first wave, Leinster and Ulster were worst affected. The almost equally severe third wave, which lasted from mid-February to mid-April 1919, affected Dublin again, as well as the western part of the island (in particular Mayo and Donegal). As influenza moved through towns and communities, schools, libraries and other public buildings were closed, and court sittings were postponed. Businesses closed sporadically on account of staff illnesses. Medical officers of health, mainstays of the Poor Law medical system, worked around the clock to treat their patients, paying 100,000 more home visits during the epidemic than in the previous year. Hospitals and workhouse infirmaries struggled to cope with the numbers of patients, pharmacists worked long hours to dispense medicines, and mortuaries, undertakers and cemeteries had to queue the dead for burial. Some areas suffered severely during all three waves, notably Dublin, where troops returning from the war may have been a major factor. Dublin county and borough had in 1918 a death rate of 3.7 per thousand living (1,767 flu deaths) and of 2.3 per thousand living (1,099 deaths) in 1919. At 3.85 per thousand, Belfast had one of the highest death rates in 1918, but in 1919 it had one of the lowest—0.79 per thousand. Some counties almost escaped the epidemic. Clare, for example, had the lowest death rate from influenza of any county in 1918, at 0.46 per thousand. Kildare had the highest influenza death rate in 1918—3.95 per thousand (263 deaths). Water and power shortages in Naas during the height of the second wave contributed to a particularly severe local outbreak in the county. Whereas influenza mortality is typically high among the elderly and very young, a global peculiarity of the 1918–19 pandemic was its targeting of normally healthy young adults. In 1918, 22.7% of all deaths from influenza in Ireland were of people aged between 25 and 35; in 1919 the figure for this age group was 18.95%. The registrar-general estimated that there were more male than female deaths from influenza in Ireland, which contrasted with the rest of the United Kingdom, where slightly more female than male deaths were recorded. Ulster followed the British pattern, as the female influenza mortality was slightly higher than the male, especially in the more industrial areas of the province. There were high proportions of women textile-workers in Belfast, Derry, Lurgan and Lisburn, and the overcrowded, hot, damp conditions of linen workshops encouraged the spread of influenza. In Belfast females between 25 and 35 had a higher influenza mortality rate than any other age or gender group in the city. Individuals employed in occupations involving close contact with the general public were more likely to contract influenza. Doctors and nurses were particularly exposed. The high number of Dublin teachers suffering from influenza in October 1918 led to the closure of schools in the city. Absence owing to influenza depleted police forces throughout Ireland. Public transport employees were also vulnerable, and in Belfast 100 tramway employees were absent with influenza during July 1918, and 120 in November. Priests and clergymen were also in the front line, and a lot of them died. Staff illness forced the closure of shops, with many shopkeepers and assistants dying. In a curious coincidence of history, the epidemic in Ireland became intertwined with the mass arrests and internment of Volunteers and Sinn Féin members in relation to the alleged ‘German Plot’. Although the internees escaped the summer wave, newspaper reports that over 100 Sinn Féin prisoners in Belfast Jail had contracted influenza during October 1918 prompted questions in parliament as to their treatment. Arthur Samuels, attorney-general for Ireland, dismissed Sinn Féin allegations of neglect and claimed that special treatment and diet were provided and that two extra doctors had been engaged to assist in the prison. Fionán Lynch, one of the inmates, attributed the prisoners’ preferential medical treatment to Sinn Féin’s highly efficient propaganda, as the British authorities wanted to avoid the negative publicity that would follow prisoner deaths. Ironically, with not a single fatality among the prisoners, Belfast Jail seemed to be the safest place in the city during the epidemic. The Irish internees held in Usk Prison, Monmouthshire, were not as fortunate. Six prisoners at Usk fell victim to flu in late November but were not provided with regular access to a doctor until 1 December. The death of Richard Coleman from Swords on 9 December bolstered Sinn Féin’s allegations of prisoner mistreatment. The timing of Coleman’s death was opportune: the general election was to be held on 14 December. Newspaper coverage of the circumstances of his death and Sinn Féin’s orchestration of his funeral procession through the streets of Dublin bought the party valuable publicity. Frank Gallagher, assistant in Sinn Féin’s propaganda department, maintained that it turned the tide of public opinion by influencing undecided voters to vote Sinn Féin. The shortage of medical personnel led to calls from many boards of guardians for the release of three Defence of the Realm Act internees—doctors Richard Hayes, Bryan Cusack and H. Russell McNabb—to do flu duty (the three were subsequently elected Sinn Féin MPs), and for Dr Kathleen Lynn, who managed to evade the initial round-up, to be permitted to come off ‘the run’ to treat flu victims. Lynn was arrested for a few hours on 31 October 1918 and was released on condition that she work with the ill during the crisis. She set up a vaccination centre and hospital for flu victims at Charlemont Street. The epidemic did not reach Reading Jail, where many of the leaders were detained, but during the third wave several prisoners contracted influenza at Gloucester Jail. Arthur Griffith tried to lift the spirits of the younger sufferers by fighting the flu on his feet, self-medicating with large quantities of quinine (which may have contributed to the health problems that led to his early demise). The death of Tipperary East MP Pierce McCann on 6 March 1919 was thought by many to have persuaded the authorities to order a general release of the Irish internees held in British jails (though in fact the orders had been signed on 4 March). Summing up the local effects of the epidemic in its immediate aftermath, Sir William Thompson noted that ‘Since the period of the Great Famine with its awful attendant horrors of fever and cholera, no disease of an epidemic nature created so much havoc in any one year in Ireland as influenza in 1918’. But, surprisingly, it has not featured in Irish historiography. The ground-breaking documentary Aicíd, screened on TG4 in November 2008, was the first programme to introduce the topic to public debate in Ireland. The 1918–19 pandemic poses a paradox for world history. Killing more people in a twelve-month period than any other calamity of similar duration, it could be considered the greatest catastrophe of all time. Remarkably, however, it has been mostly forgotten. In contrast to the worldwide large-scale commemoration and memorialisation of the First World War, there are no museums, heritage centres, exhibitions, national monuments or remembrance days dedicated to the pandemic. Unlike the extensive cultural memory of the Great War, the Great Flu has barely had a passing mention in literature. Edvard Munch’s self-portrait [front cover] is one of the few works of art on the subject. No epic feature films depict the ravages and human suffering caused by the pandemic. Memory was mainly confined to private spheres, and the personal grief for lost loved ones, long recalled in family traditions, was not vented in public. There are many possible reasons that could explain this social amnesia. 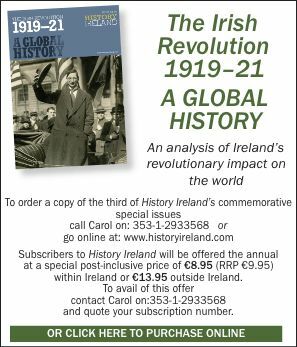 Globally, the Great Flu was overshadowed by the upheaval of the Great War, while political turmoil in Ireland during this period may also be a factor in its omission from Irish historiography. It was a passing episode—striking suddenly and then just as mysteriously disappearing. Social psychology shows that memory is often founded on schemata, or templates of earlier memories, but, unlike other diseases, influenza was not lodged in popular memory as a cause of terror. Moreover, high politics dominated history-writing at the time and influenza did not kill any famous national figures. 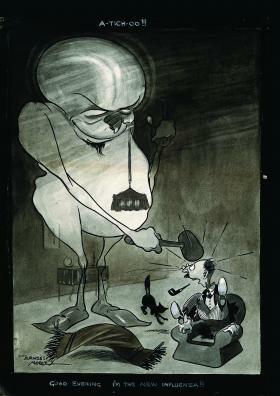 Contemporary Ernest Noble cartoon- ‘God evening, I am the new influenza”. While it is possible to politicise a natural disaster, the global dimension of the pandemic overruled incrimination of local villains (despite Irish republican attempts to finger Perfidious Albion). In recent years, however, the looming threat of an outbreak of a new influenza pandemic has reawakened general interest in the Great Flu of 90 years ago. Guy Beiner is a senior lecturer at the Department of History in Ben-Gurion University of the Negev, Israel. Patricia Marsh is a Ph.D candidate at the School of History and Anthropology, Queen’s University, Belfast. Ida Milne is a Ph.D candidate at the Department of History, Trinity College, Dublin. J. M. Barry, The Great Influenza: the epic story of the deadliest plague in history (New York, 2004). N. Johnson, Britain and the 1918–19 influenza pandemic: a dark epilogue (Oxon, 2006). H. Phillips and D. Killingray (eds), The Spanish Influenza pandemic of 1918–19: new perspectives (London and New York, 2003).